Item # 289347 Stash Points: 1,397 (?) This is the number of points you get in The Zumiez Stash for purchasing this item. Stash points are redeemable for exclusive rewards only available to Zumiez Stash members. To redeem your points check out the rewards catalog on thestash.zumiez.com. 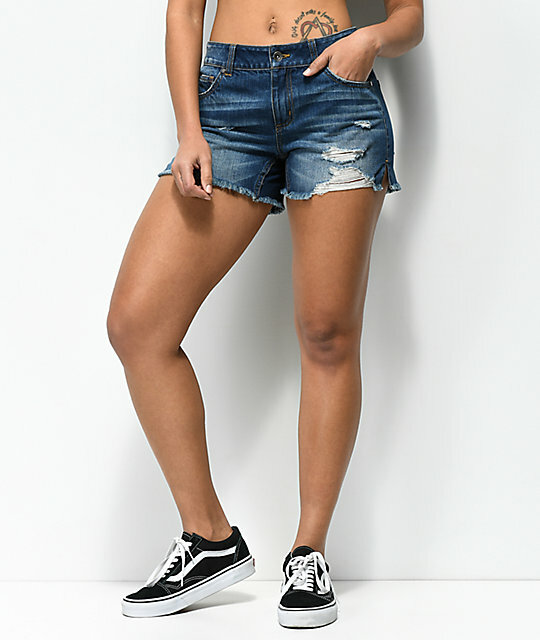 The perfect balance between cheeky shorts and boyfriend shorts are the Emma Distressed Girlfriend Shorts from Empyre. Stretch denim creates a relaxed and easy fit with a reasonable 4" inseam while the custom rips and distressing add character. Featured in a medium blue jean wash with light whiskering at the upper thighs for an authentic look. Emma Distressed Medium Wash Girlfriend Shorts from Empyre. Medium blue jean washed denim.